Mazda MX‑5 RF features Machine Grey paint ‑ Grey like you’ve never seen before. Mazda leadership is best realized through such innovations as our commitment to KODO design – a design language which translates into each automobile’s graceful, yet energetic lines – ultimately expressing power and beauty through its sense of motion. Little surprise, then, that Mazda does much more than apply paint to our cars – because we consider colour to be another key element of form. Mazda leadership is best realized through such innovations as our commitment to KODO design ‑ a design language which translates into each automobile’s graceful, yet energetic lines ‑ ultimately expressing power and beauty through its sense of motion. Little surprise, then, that Mazda does much more than apply paint to our cars ‑ because we consider colour to be another key element of form. Through employing Takuminuri painting technology, we focus on a three-coat layer comprised of colour, reflective and clear coats to arrive at a brilliant, high-density finish that adds a lustrous sheen when it’s illuminated and a genuine metallic look. The resulting colour ‑ which we call Machine Grey ‑ fully expresses the MX-5’s sense of strength and precision. In fact, our belief in this colour translates to now offering it on both the Mazda MX-5 RF and the new CX-9. Further, it’s a shade that offers a strong contrast between light and shadow, while its sleek finish simulates sculpture, as if created out of a solid steel ingot. The end result is an automobile with the custom look of a hand-painted concept car – often painstakingly achieved through the use of extremely thin aluminum flakes applied in multiple layers. Mazda’s careful approach has yielded a similar effect through a 3-layer application: colour, reflective and clear coats – applying this to its larger-scale production. If it’s detail you’re after, know that this same Takuminuri technology yielded Mazda’s distinctive Soul Red colour and the same principles apply. 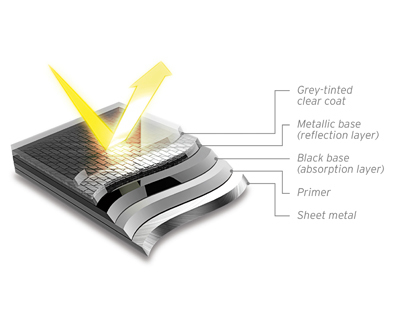 The all‑important reflective layer is home to very fine, high-brightness aluminum flakes evenly applied, drying to a layer measuring ¼ the thickness of most reflective layers. The further application of a jet-black pigment to both colour and reflective layers transforms the already-metallic-looking finish into an even higher level of contrast for added depth, and further contrasting the light to dark effect. Seems like a lot of extra trouble to go through but, for a car company who sincerely believes that “Driving Matters” on all possible levels, the investment into technologies responsible for creating fresh colours that further contribute to a vehicle’s form is well worth the effort.